I'm trying to grow chilis. I'm not the sort with green thumbs so this could be disasterous. I've always wanted my very own garden, full of wonderful vegetables and herbs that I can prune and pick for my daily food adventures. Mostly because I like the idea of self-sustainability but also because I find the whole process fascinating and scary. 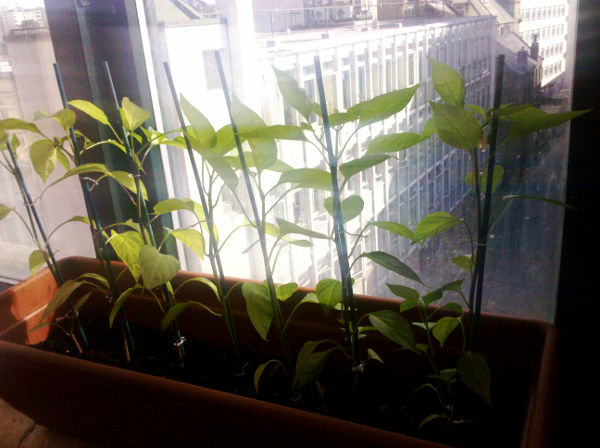 Disclosure: I am bad, bad, bad with plants. In all my years of 'dealing with plant-based lifeforms', I tend to overwater them as compensation for neglect even when I try my best not to. This might explain my fascination with 'gardening' games/simulators even if I don't really play them as much as I seem like I should for the level of fascination; I'm just infatuated with the concept. And no, NOT farmville - more Harvest Moon and Rune Factory and even Pikmin actually. I guess this could also explain why we have a gardening system in our vurtual world even if you were mainly growing balloons. 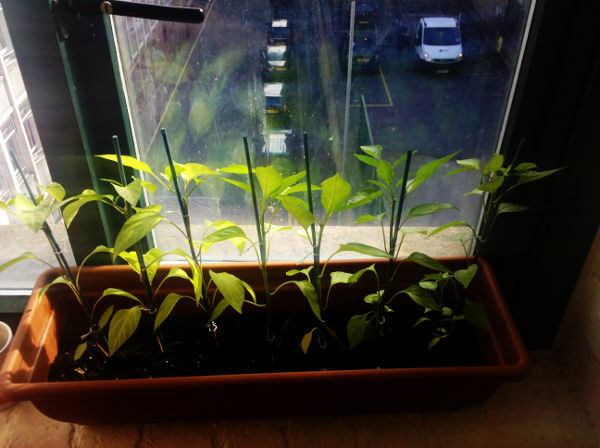 So I've picked a few random pots of chili mixture - jalapeno, cayenne and sweet peppers. 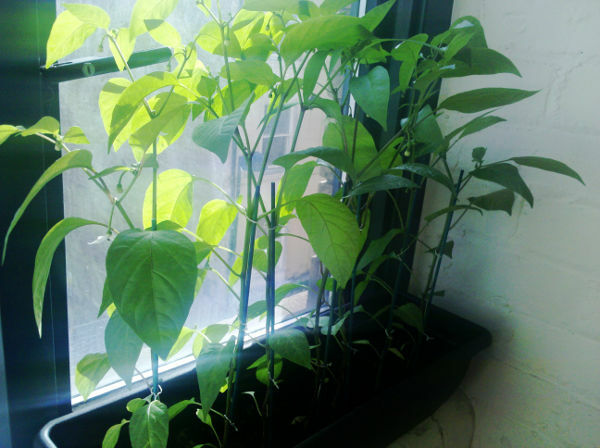 The jalapenos seem more encouraged and the tiny pot has yielded about 20 seedlings but both the cayenne and sweet peppers managed just a couple of seedlings each. To be fair, I bought the pots rather late - about 3 weeks ago, I think - so the fact that there are even any seedlings appearing is amazing. I also will mention right now that I live in an apartment with little room for such a 'grand' endeavour so all of this will be taking place on a window sill in the living room that is also the kitchen. There is some space beyond the window sill as I figured I could sacrifice this portion of the apartment as my experimental mini garden. Anyway I bought a long, plastic pot-type thing and then filled it with dirt (a 15 litre bag of compost mix) before I transfered all the little seedlings carefully into the new pot. I've not done this before so it got a bit messy but I got there in the end and currently, this is what they look like the next day. 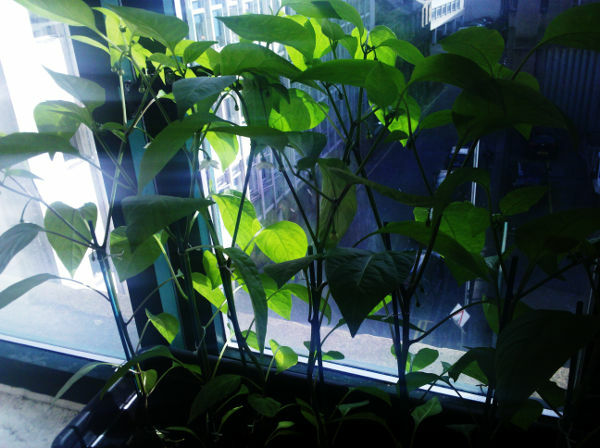 Somehow it didn't seem interesting to post daily photos of the chili growth, seeing as how it looks the same except for slight spurts of height. From just the one pot, it seems to have grown into 2 (and a couple more plants stuffed into a milk carton). They do seem to have flourished, especially that one pot with the crazy, lush green leaves which seems to be flowering quite nicely. The other one seems to not be as green but there were a couple of flowers that bloomed and fell off. 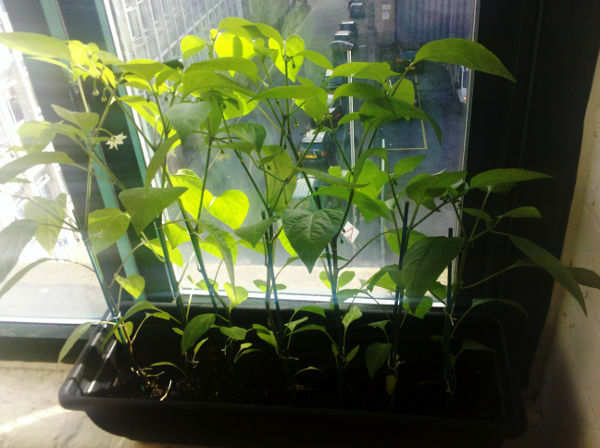 The lush ones are jalapeno chillis whilst the less green ones are a mix of bell peppers and habanero. The difference in species could explain the different outcomes. 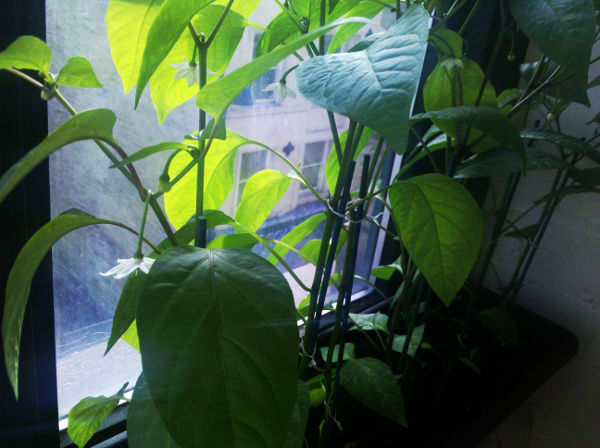 The internet tells me I'll have to wait 2 weeks before the flowers go away and be replaced by actual chilis. Let's hope that's the case!